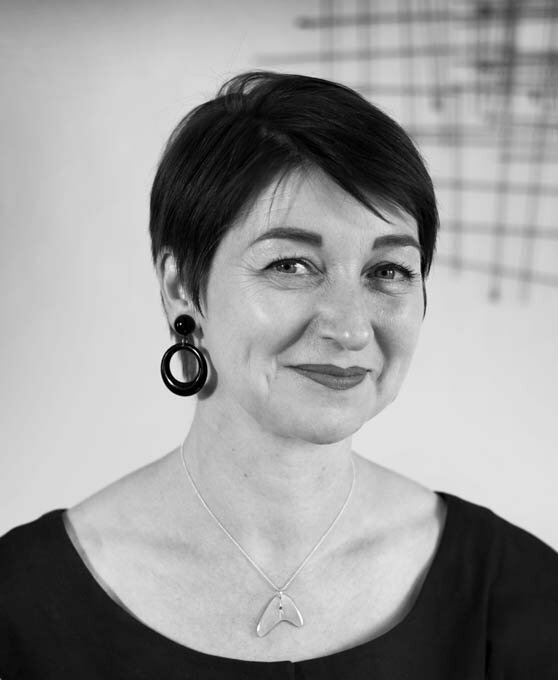 I’m Helen, a textile designer by profession and a lover of all things vintage, from the fashion and clothing to the fabulous cars, music and architecture from the iconic 40s and 50s period. I have a passion for collecting vintage clothing, furniture and homewares and I also love to sew my own clothes using original patterns. My business is a combination of my love of mid-century style with my ability to design and create pattern and textiles. 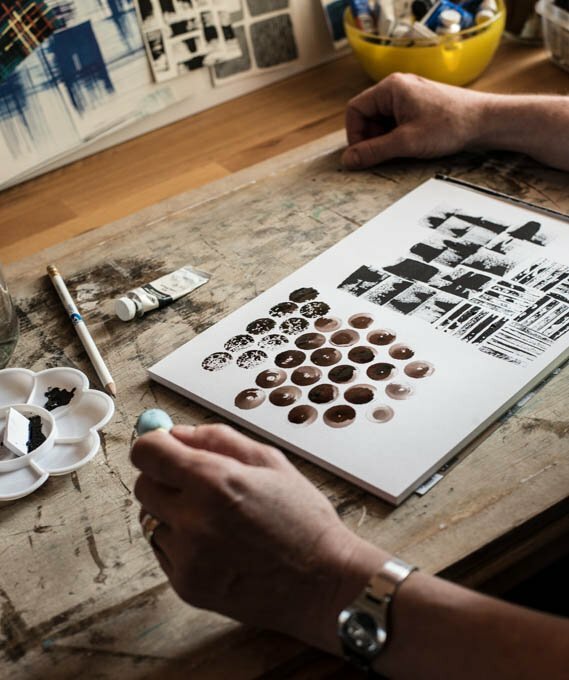 After graduating from Winchester School of Art with a degree in Printed Textiles, I spent my early career creating and selling designs in the US, Europe, Japan and Australia to high profile companies such as Levis, Jantzen and Pendleton and even to the New York Metropolitan Opera House. I then went on to work for UK high street names such as River Island, Debenhams, and Marks and Spencer. Though I enjoyed it and learned a lot what I really wanted was to be able to create my own unique prints. 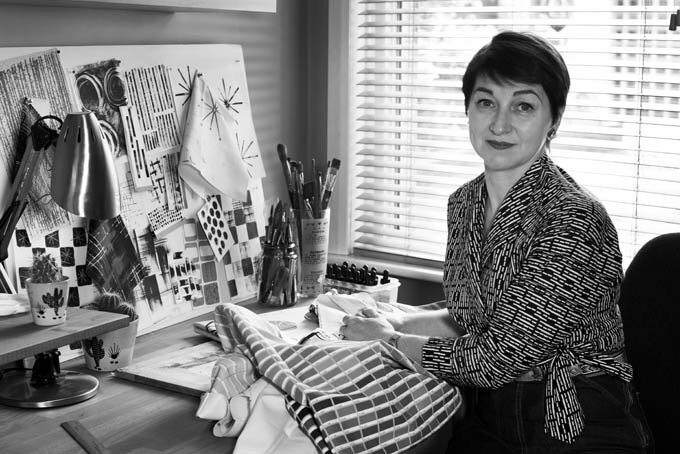 Six years ago, I made the decision to combine my passion with my skills and launched my own business designing and selling my own range of mid-century inspired dressmaking fabrics, lampshades and beauty accessories. One of the most frequently asked questions I have been asked is if I can supply my designs on heavier weight fabrics suitable for upholstery and interiors. I have now launched a brand new range of fabrics perfect for this very purpose; I also have plans to extend my designs to matching homeware products in the near future. Authenticity, honesty and integrity is the cornerstone of everything I do and I believe passionately and wholeheartedly in supporting our UK manufacturing industries. All my fabrics and products are designed in London (which is the easy part!) and they are also printed and manufactured here in the UK. 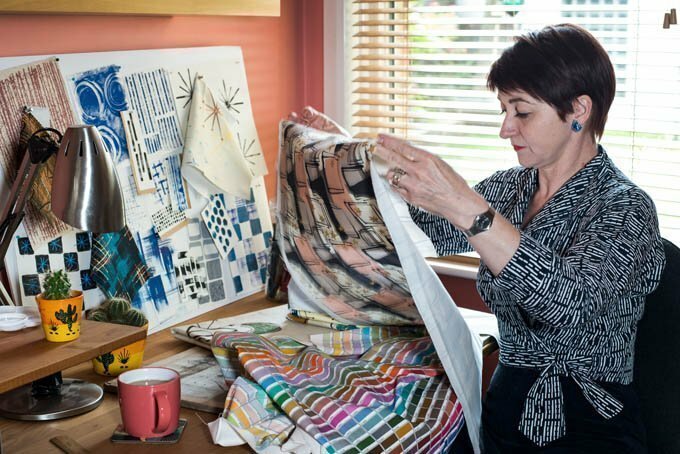 I am also able to offer a bespoke service to interior designers, upholsterers and clients who would like something unique and original, whether that is one of my existing designs in a different colourway or an entirely new design. I am happy to discuss your brief and the options available to enable you to have a unique design to your own specifications. I can be inspired by almost anything: the iconic images and shapes of the 40s and 50s atomic age to patterns and textures from nature. I love the textures created by light being filtered through trees or even just through a window blind. I am obsessed with pattern and the process of creating a unique finished product that can be used to potentially transform a room or worn as a garment; that’s what gets me excited. 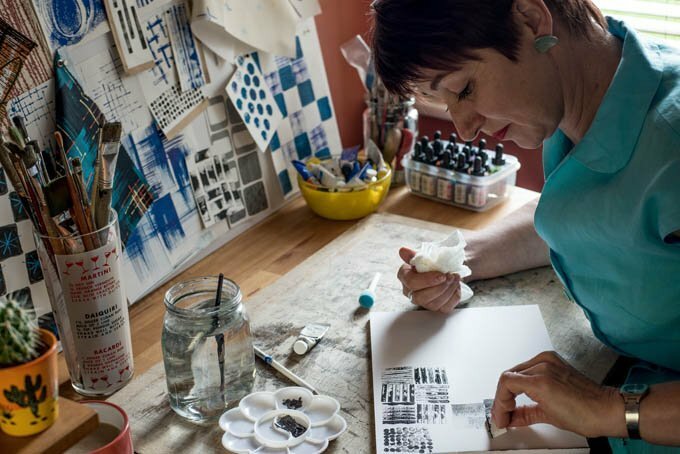 I think the way that I work is quite unusual for a textile designer. I will always begin the process with experimental textures and mark-making usually only using black and white although I will often have a wider colour palette in mind. This has always been the part of my work that I enjoy the most. I am always looking for new ways to replicate a texture I have seen somewhere be that in a vintage print, in nature, or in my everyday life. 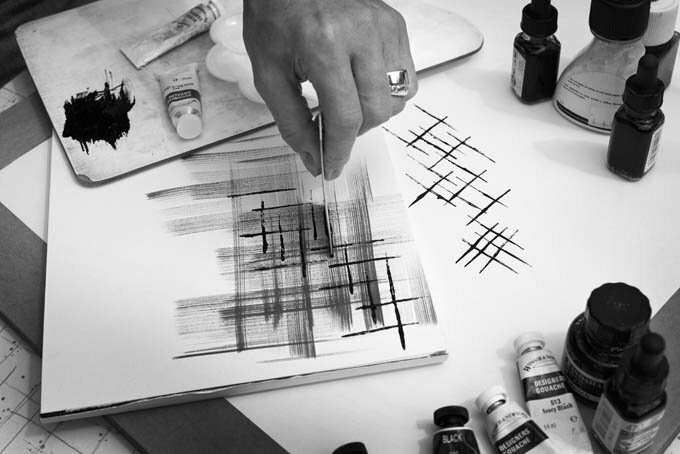 It is only when I am happy with a mark or texture created by hand that I will then turn to my computer and scan in the work to create the structure of the design. I will then progress to build up my layout, repeat, and then start to build in the colour. What I love about the design of vintage textiles is their hand drawn artisan qualities. The lines are rarely straight, circles are never perfect, bits overlap and printing is sometimes off-register. I often see people digitally recreating mid-century style textile prints in Adobe Illustrator or Photoshop. For me personally, this purely digital approach does not really capture the true essence of a vintage, hand crafted print; the lines are often too sharp and straight, and the curves and circles are too perfect. I firmly believe in maintaining the traditional and authentic techniques for my print designs combined with modern digital production methods to produce the final unique product.